I'm continuing to use the beads sets I created a couple days ago ... Cut an 8" piece of chain to which I added 21 charm bead sets. 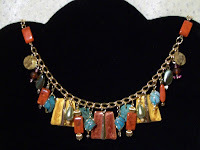 These sets are comprised of both new beads and vintage beads/charms pulled from my 'yard sale' inventory. 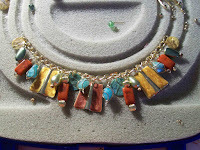 Then, added a divider bead on each side and another section of chain, to which clasps are added. All together, it's 18" long. Tried it on; wore it around for a little while to make sure it lays nicely, the bead sets do not fold upon themselves, etc. All is fine; I like this one ... it's a keeper.